You can pay a lot of money when going out to a restaurant for a nice, flavorful steak dinner. Or you can stay home and make it yourself! All you need is a good steak, a cast iron skillet, a gas grill with side burner (or stovetop and oven), butter and a high-smoke-point oil (like avocado oil), salt and pepper, and a pair of long-handled tongs. Using a cast iron skillet is one of the best methods to cook your steak, but you also need to make sure you begin with a good steak to get the best results. Talk to your butcher about getting a nice cut of meat like a boneless ribeye steak—boneless because the bone can reduce contact with the pan and, therefore, reduce the amount of caramelization on the outside of the meat. Look for a "choice" or "prime" grade steak, though keep in mind prime grade will cost a lot more. You should also have a good instant-read digital thermometer for taking the internal temperature of the steak. You don't want to cut into the meat until you're ready to eat, so having this tool is the best way to determine doneness. Also, keep in mind—this cooking method uses extreme temperatures that can melt through oven mitts so be very careful! Once you have your steak, lightly coat it with oil. Choose an oil with a high smoke point, as oil breaks down at high temperatures. Oils like avocado oil can take a much higher temperature than most. It is very important that both sides of the steak are well coated with oil, but there is no need to worry about the edges. While the steak won't stick to the pan, you need the oil to conduct the heat from the pan to the meat as fast as possible. This cooking method is all about speed so stay close by. Now it's time to season the steak. Typically, this includes coarsely ground black pepper and a coarse sea or Kosher salt. The oil is going to hold the seasonings in place and if you choose to make a sauce in the pan later, this will provide the extra flavor. Apart from salt and pepper, many restaurants add dried parsley or other herbs to the mixture. You can use anything you like, but keep it light. You want to maximize the flavor of the steak, not the seasonings. If nothing else, you need the salt to react with the surface of the meat to produce the right flavor. Let the salt sit on the steak for a good 15 minutes before cooking so it has time to absorb into the exterior. The actual cooking can be done with a side burner and grill, or a stove top and an oven. You need the burner to heat the skillet and start the steak cooking and the grill or oven to complete the process. Either way, the grill or oven needs to be preheated to a high temperature, around 500 F (260 C), but any temperature of 400 F (205 C) or higher will do. To make this whole process work, you need a smoking hot cast iron (or heavy-duty) skillet. And smoking hot means just that—hot until it is smoking. The pan also needs to be clean and without any oil (other than what a good cast iron skillet is seasoned with) or cooking spray. All the oil you need is already on the surface of the steak. Place the cast iron skillet on the burner set to high heat and allow to heat up. To test if the pan is hot enough, place a single drop of water on the pan. If it dances for a second before disappearing, the pan is hot enough. Make sure to have the steak, a clean plate, a heavy-duty grill mitt, a pat of butter, and a pair of tongs ready. You won't have a chance to step away once you start the cooking process. This will generate a good deal of smoke, popping and sizzling, but you must wait exactly 2 minutes before moving the steak. You might think it is burning, but rest easy that everything is fine. Be patient and watch the clock closely. After 2 minutes, turn over the steak, placing it exactly where it was, making sure it is well seated in the pan. There should be a rich deep brown (not black) color on the cooked surface. Continue cooking the steak for an additional 2 minutes. Again, be patient and let the steak continue to cook (burner still on high). During this time, make sure you have your grill (or oven) mitt on. This needs to be a good mitt since the metal you are about to pick up is heavy and nearly 500 F.
The steak has been cooking for 4 minutes; if you want it very rare it's time to take it off the heat. If you want it more cooked than this, transfer the skillet to the preheated grill (or oven). Drop a pat of butter on the top of the steak right in the middle. This butter will melt quickly and pour down over the steak giving it an extra rich, caramelized, nutty flavor. Close the lid of the grill, or the oven door, and let cook until the desired doneness. To get a precise temperature reading on this steak, use an oven-safe thermometer or digital thermometer (the kind with the remote unit so you can read the temperature without opening the lid or door). Testing for doneness is both an art and a science. If using a thermometer, you should be able to closely gauge the doneness of the steak. Remember that you need to remove the steak when it is 5 F (2.7 C) below the target temperature. This is because the steak will continue cooking for a few minutes after it is off the heat. If you want a medium rare steak (about 130 F or 55 C), then you need to remove the steak from the grill and out of the skillet when the center of the meat reaches 125 F (52 C). When the steak is ready to be removed from the skillet, place it on a plate and gently cover with a piece of aluminum foil. Let rest for 5 minutes. The resting time allows the juices to redistribute into the meat making it nice and tender. The steak is out of the pan, and the drippings in that pan are so good you'd lick it clean if it wasn't 500 F. But don't discard the drippings—turn them into a delicious sauce. Throw in 1/2 cup shallots, 1 cup red wine, 2 tablespoons Dijon mustard, 1/2 cup fresh chopped herbs (basil, ​oregano, cilantro, parsley, etc. ), and 2 crushed garlic cloves. Stir everything together in the hot pan and pour out into a dish. 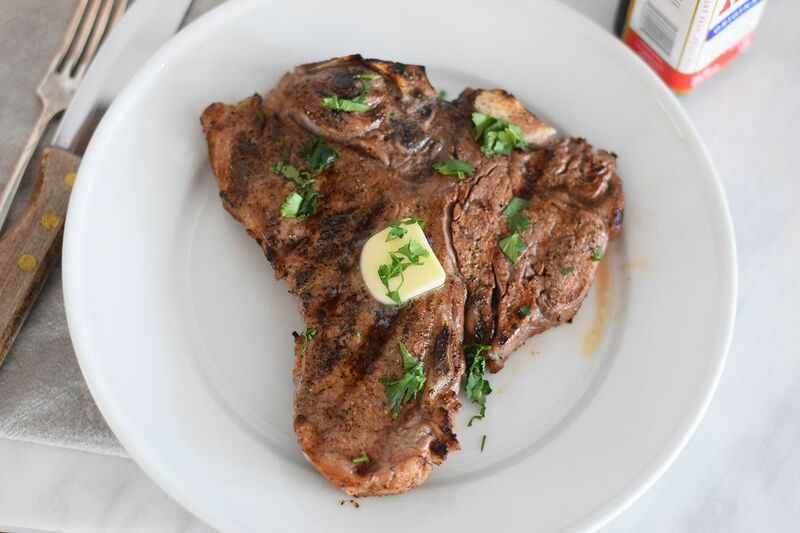 Top the steak with this sauce or use it on baked potatoes, vegetables, or any other side dish you have to go with this delicious restaurant quality steak.